The Black German Shepherd is one of the most beautiful dogs you may ever see. There are actually some differences between it and theWhite German Shepherd. It is known to be more calm and not as aggressive as the other colored Shepherds. The only way for the Black color to appear is for both parents to have the recessive gene for solid black. 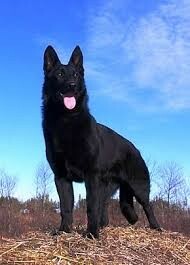 If this is the case, then there is at least a possibility for a black Shepherd in the litter. Please click our first link to read more about the genetics behind and the character traits and temperament of the Black Shepherd.